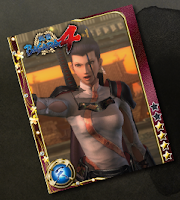 I'm finally back home after the traditional Christmas visits to the homes of my various relatives, and it seems that there's a lot of Sengoku Basara 4 news I need to summarise before today's livestream begins! Please excuse the number of pictures in this extra-long holiday news post. There wasn't much notice given for yesterday's Famitsu Live presentation, and it's a shame as it included gameplay from Yamanaka Shikanosuke and a glimpse of . Capcom producer Kadowaki Akihito took the audience through the Sengoku Basara 4 introduction this time, explaining everything very clearly. Kadowaki has been working on the Sengoku Basara series for a while and does much of their social media and promotional work. The first gameplay demonstration had Shikanosuke battling against Shimazu Yoshihiro on the Satsuma: Inner Castle stage. 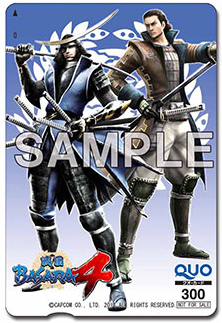 There were 'outbreak' animations played at the start showing Aniki and Magoichi on the Hyakki Fugaku, Masamune and Yukimura teaming up at Osaka Castle and Katsuie marching to Shizugatake. 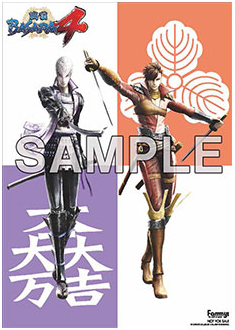 Shikanosuke's Basara-e illustration was revealed to be a pair of deer, and his title is 鹿々. This literally means 'many deer', though it could be a pun on a word with the same pronunciation which means going forth swiftly, with resolve. 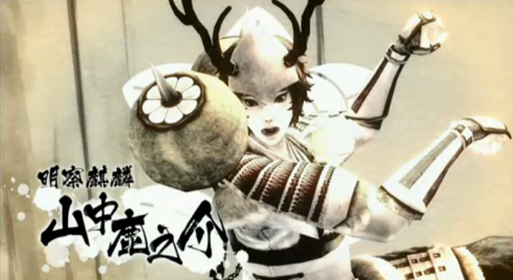 The second part of the gameplay demonstration showed Katsuie on a stage where the Toyotomi and Matsunaga armies are locked in combat, 'Toyotomi Reminiscence Struggle'. Although the selection screen wasn't shown I happen to know from a previous sighting that Hideyoshi is the boss of this stage when it appears as an outbreak battle. It's yet another 'intrusion' fight with Hanbee and Kotarou on the battlefield from the outset. Watching made me very excited thinking about the storylines which might be linked to this fight. If you missed the original broadcast, you can catch the gameplay segments via the illicit uploads on NicoNico (1, 2) or YouTube (1, 2). All forty characters now have profiles and voice samples on the roster page. 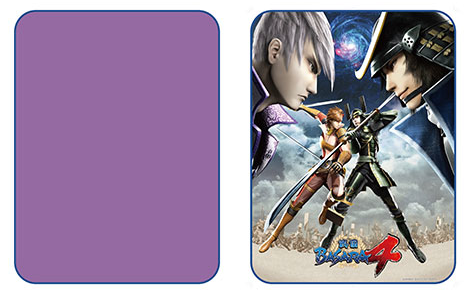 The four new stages previewed in Weekly Famitsu magazine last week are now on the official website too for everyone to enjoy. 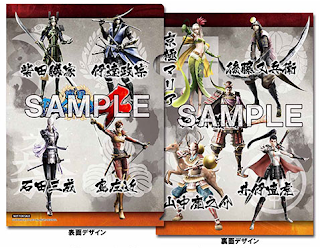 Those who want to see the contents of the Hyakka Ryouran Tamatebako special edition of Sengoku Basara 4 can now watch this special video to see little ashigaru sprites explaining each item. Although there's nothing new for those of us who have been following the updates regularly, it's still kind of cute. 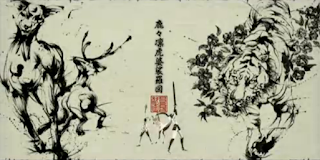 Another recent video addition to the Capcom Channel is this Monster Hunter 4 advertisement for Miyagi prefecture. 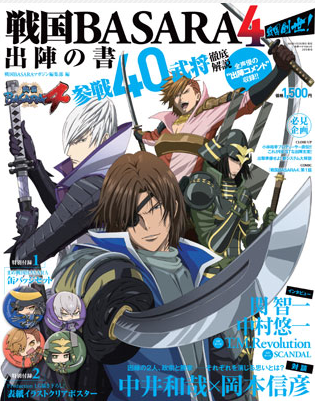 It has nothing to do with Sengoku Basara whatsoever, except that the Date Bushou-tai are the stars of the video. The Date Bushou-tai is one of several groups which regularly performs as famous figures associated with the Date clan to draw tourists to the area and teach people about history. 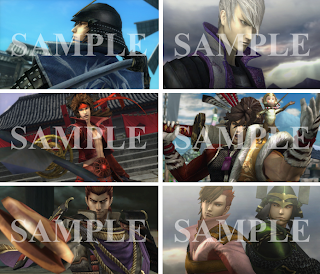 Lawson is a major chain of convenience stores in Japan and from 7th January until things start to wrap up on 20th January 2014, they'll be running a special Sengoku Basara 4 campaign in their shops, on Twitter and through their Loppi preorder system where people can earn unique merchandise. 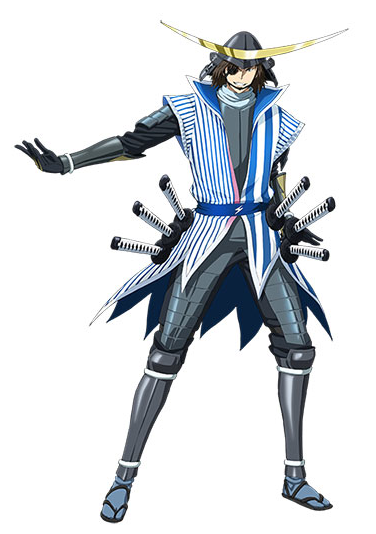 Date Masamune has customised his outfit like a Lawson uniform to help promote the tie-in. It's the anime-style Masamune as designed by Ookubo Tooru, interestingly. The range of prizes can be seen on Lawson's microsite, and includes a mini screen panel signed by Nakai Kazuya, an alarm clock with Masamune's voice, a decorative wallscroll, a Masamune rubber strap and a set of three A4 clear files. These prizes are for customers who submit the serial numbers on their Lawson receipts during the campaign period. In addition, users of the Lawson app can get a rare Ii Naotora card for mobile game Sengoku Basara Card Heroes Matsuri from 7th January until 26th January 2014. And fans who follow the official 'Lawson Crew Akiko-chan' Twitter account and participate in some retweeting between 7th and 13th January might be selected to win a clear poster with the illustration used on the HMV/Loppi special edition cover. A Japanese address is probably necessary to claim the prize. 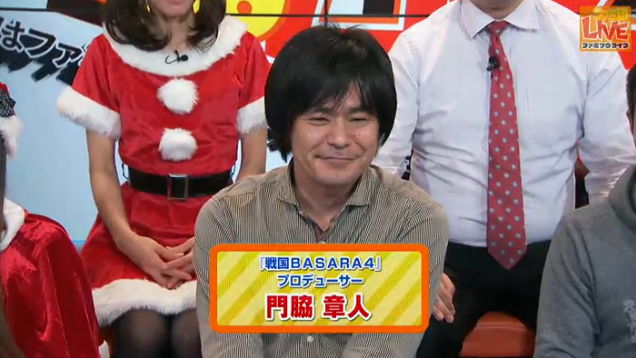 There will also be a stamp rally app tie-in and scheduled in-store announcements by Masamune's seiyuu Nakai Kazuya. They're really going all-out with this campaign! 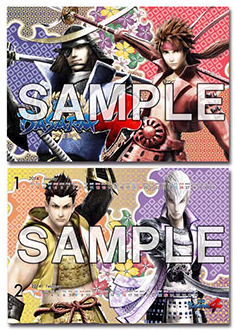 Joining the extensive range I posted about earlier is a second wave of event merchandise that fans can pick up at Sengoku Basara 4 Basara Matsuri ~Shinshun No Utage~ on 19th January 2014. The 36-page full colour A4 pamphlet for ¥2,000. It will contain messages from SCANDAL and T.M.Revolution as well, but there's a note that Seki Tomokazu isn't included inside as his guest announcement came too late. A fluffy blanket for ¥4,000. A vinyl tote bag with pass case for ¥3,500. It's large enough to hold the event pamphlet. 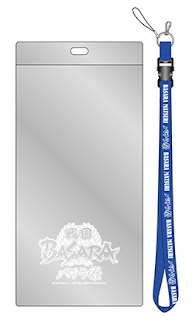 A ticket holder for ¥1,000. 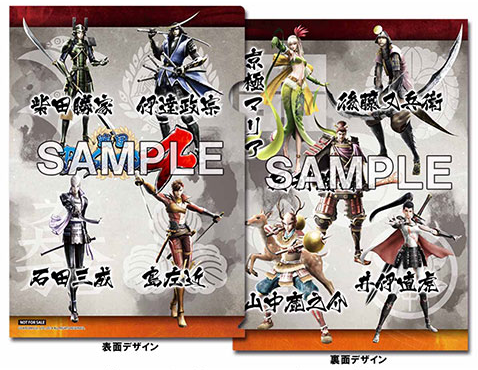 Customers who spend more than ¥3,000 will receive one of twenty randomly-packed digital prints showing scenes from the game. 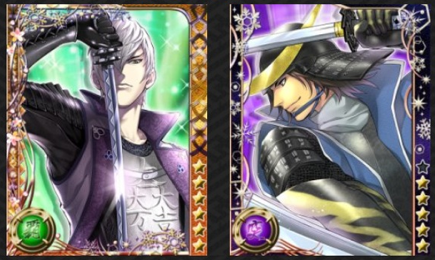 A batch of new cards has arrived in mobile game Sengoku Basara Card Heroes Matsuri and with them are a few new illustrations. We're getting two new manga in the next few weeks (with one of them starting tomorrow) and now we have the details for the other! 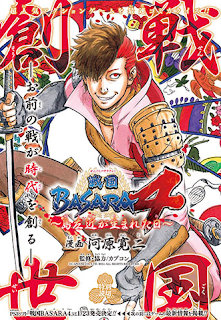 The February issue of Jump SQ released on 4th January 2014 will present a one-shot manga story from artist Kawahara Kanji. The main character will be Sakon and the title will be Sengoku Basara 4 ~Shima Sakon Ga Umareta Hi~ ('The Day Shima Sakon Was Born'). 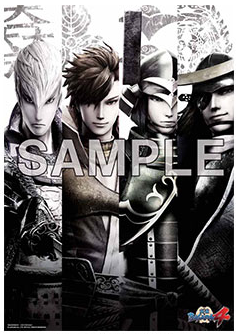 The e-Capcom store has updated to show the cover artwork for January's Sengoku Basara 4 Sousei: Shutsujin No Sho guide book. Production I.G. have produced another special illustration showing the characters with their anime designs. 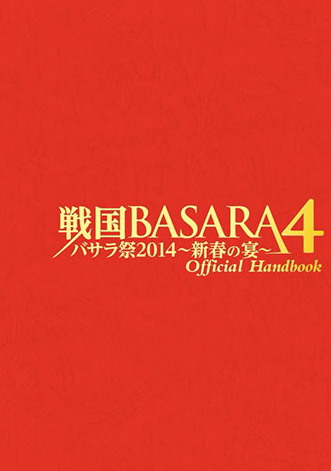 Buys will get 104 pages of Sengoku Basara 4 information along with a clear poster for just ¥1,500. 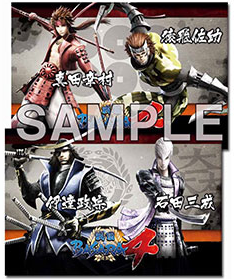 As promised, there are also Mame Sengoku Basara badges for the four main characters. 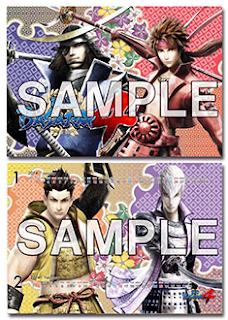 Joining all of the DLC packs are a number of physical bonus items that you can get by preordering Sengoku Basara 4 at vendors such as Ami Ami and Karuwaza Online. Capcom decided to list the rest and save everyone from trying to find them all the hard way by publishing a full list of preorder bonuses this week. 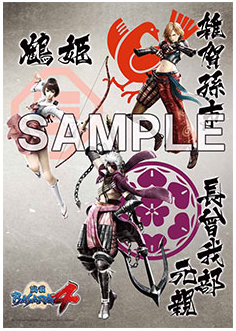 Yamada Denki is offering an A4 clear file. 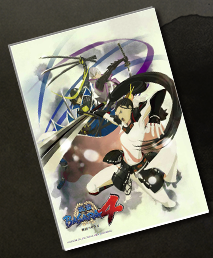 Fammys has an A3 wall scroll. Futaba Tosho and Doki Doki Boukenjima have an A3 clear poster. 7Net Shopping has a set of two postcards. Seagull is offering a Quo card. Imagine has a large poster (approximately A1 size). Last of all, the Sanyodo chain has a desk calendar (I mentioned this briefly before). 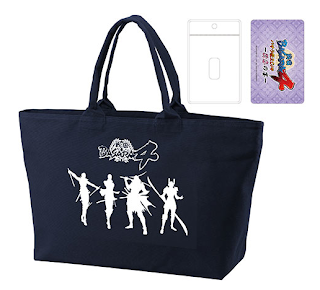 Most of these stores (if not all of them) are Japan-only, so to get these items you'd need to be based in Japan or have a forwarding address and payment method prepared. None come with exclusive sleeves or DLC codes. And that's all for now! I'll be back in a couple of hours after watching this fortnight's new livestream, which will begin at 22:00 and feature Okiayu Ryoutarou (Toyotomi Hideyoshi) and KobaP as guests.